Being an NYC journalist exposed me to more opportunities. While working, I took the opportunities to broaden my horizons and get more connected to the world. I captured the moment when New York Stock Exchange’s closing bell rang for the 20th anniversary of Hong Kong’s return to China, went to the media forum held by Chinese Consulate General in New York, and took a one-on-one interview with Chinese pop star. 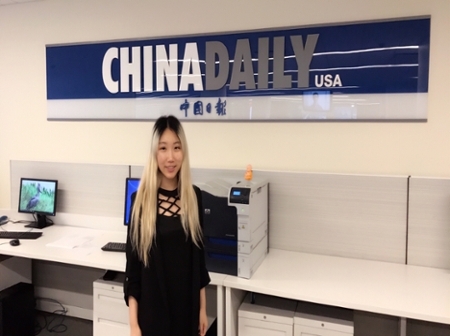 During my internship, Chinese visiting scholar Zhang Yingying’s missing drew wide attention. I did follow-up and wrote five articles until the breaking of the case. During the process, I contacted FBI, University of Illinois Police Department, Zhang’s family, UIUC Associate Chancellor and so on to obtain first-hand information from different angles. I always kept myself updated at the earliest time. Sometimes I stayed late to contact more potential interviewees, and search for all available information online regarding the case. I felt it meaningful to contribute one bit of force to the case as a journalist. My bilingual skills and writing proficiency were highly required by the position. I took some writing classes at school which prepared me well and let me feel comfortable while working. Besides, my interpersonal skills, adjustability, flexibility, and critical thinking all helped me a lot during working. The internship prepares me for my future career not only because it helps me build my professional skills such as research, interview, news writing, photography, video shooting, video production, translation, etc., but also because it improves my working ability and provides me with wide social knowledge. “Professionalism” is what I have learned most, and other working abilities such as interpersonal skills are also very crucial to future career.